The Children’s Choirs of “Coral Renaixença” were founded in January 1979. Their first oncert was on 27th July 1979. Soon after that, the members of Coral Renaixença decided to name the children’s choirs “Patim-Patam” for the little ones, and “Esqueix” for the teenagers. In 1994-95, a new choir was created due to the great number of kids interested, and it was named “No ve d’un to”, which was for teenagers (11-15), so we changed the ages for the other choirs leaving “Patim-Patam” for kids from 3 to 5 and “Esqueix” for kids from 6 to 10. We are currently a group about forty singers between 3 and 16 years old. Over these years we have performed in about 300 concerts throughout Catalonia. During Easter 2002 we made our first trip abroad in an exchange with the Santo António dos Cavaleiros (Portugal) choir, which had visited us the previous year. In 2010 we performed in Vitoria as part of another exchange with the Olabide Haur Olabide Ikastola choir from that city. 1988; the “9 trobades de corals infantils” between 1980 and 1989; the 25 concerts performed in Montserrat; the concerts in Palau Sant Jordi (Barcelona) together with the other choirs from SCIC between 1997 and 2006; and the concerts “Juguem Cantant” of the choir Patim-Patam”. We have also done two concerts using Walt Disney music, the first one in 1989 to celebrate the 10th anniversary, which we performed several times throughout Catalonia, and the second one in 1994 due to the 15th anniversary. 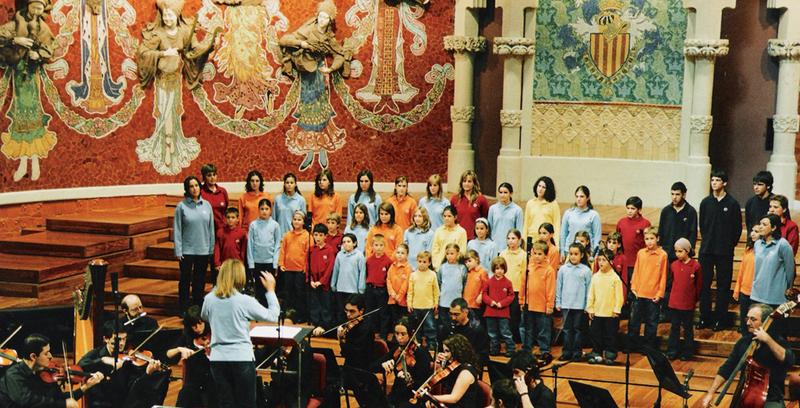 For the 25th anniversary we did a cantata called “43 minutes and 31 seconds with Yoli Pastitxet”, by Antoni-Olaf Sabater, which involved nearly 400 singers from various schools of Sant Boi, thus participating with us at the “Palau de la Música Catalana” (Barcelona) in 2004. For the 30th anniversary, the choirs “Patim-Patam” and “Esqueix” performed the “Cantata per una Tortuga” by Dani Coma Pedrals; the “No ve d’un to” choir danced and sang a collection of songs from the musical Mamma Mia, ABBA, translated into Catalan by Laia Cobo.